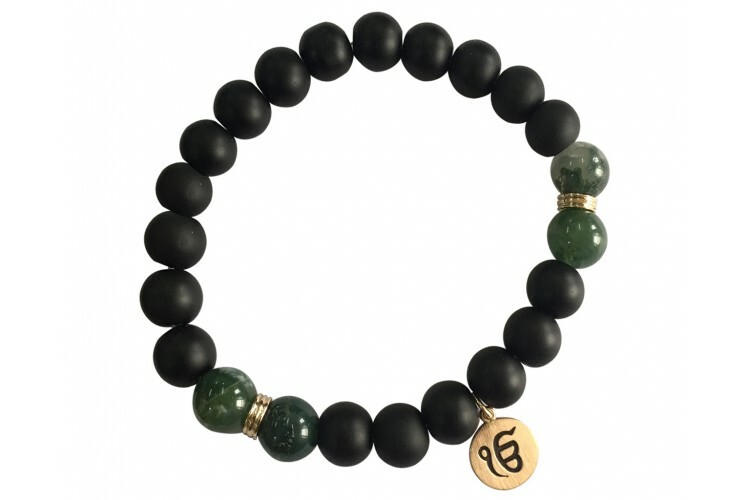 This fabulous AUMKAARA bracelet strung with healing natural Moss Agate and black onyx with a Gold IK Onkaar is what you want to wear for healing, emotional balance & strength. Strung on a stretchable elastic it is adjustable and yet can be sized by adding or removing beads. 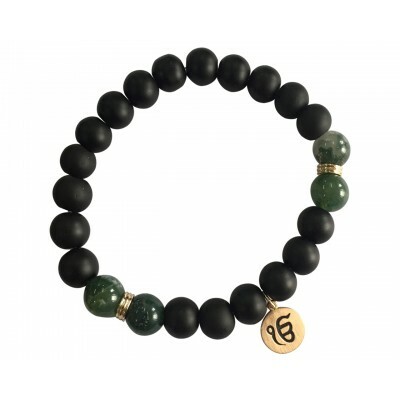 Available in 10mm bead size for men and 8mm for women. Natural Moss Agate crystal healing properties are powerful for all energy centers in the body because it heals on all levels – physical, spiritual, and emotional. It is excellent for grounding because its healing properties help reconnect us to Earth. 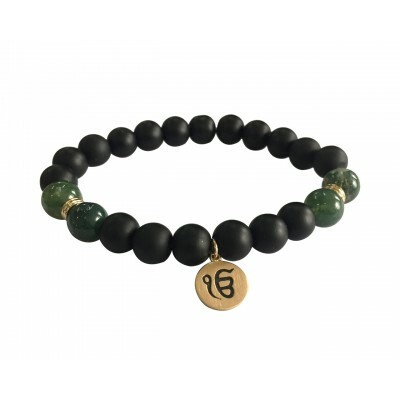 Moss Agate in Chakra healing is associated with the Heart Chakra, located near the center of the breastbone. 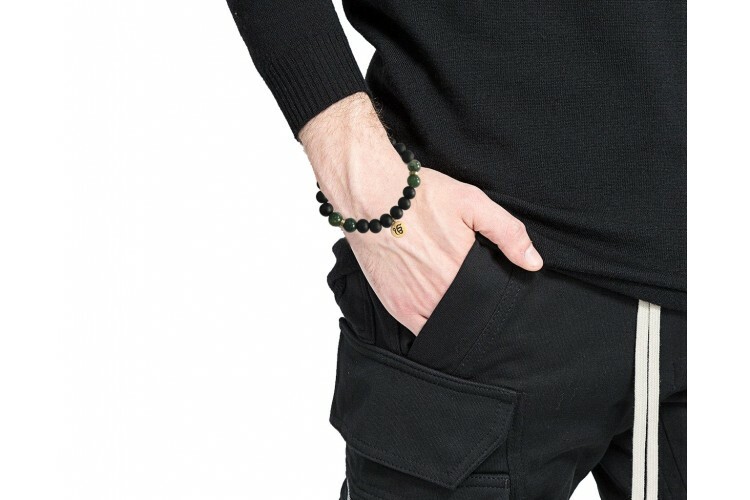 This coupled with the Black Onyx which is a powerful protection stone, Black Onyx absorbs and transforms negative energy, and helps to prevent the drain of personal energy. 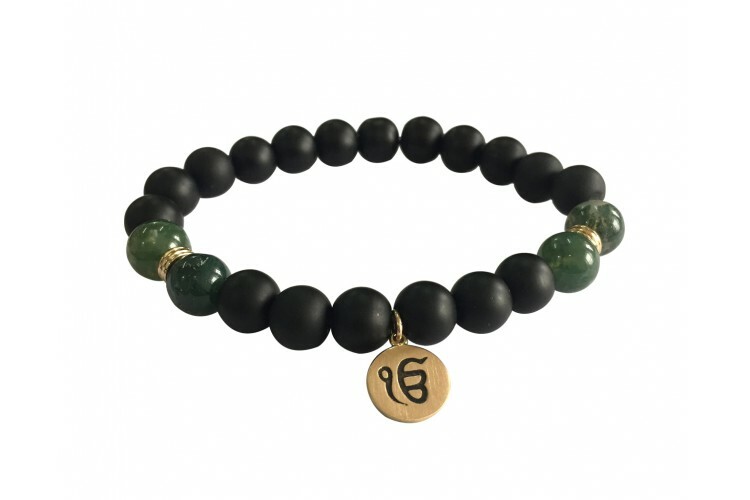 Aumkaara jewellery has been fashioned to empower people to stay connected to their spiritual side and at the same time bring peace, tranquility, hope and faith in your daily life. A thoughtful gift, A style statement.